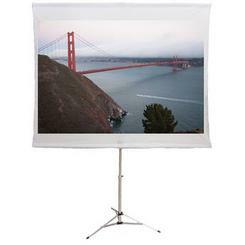 Designed for indoor/outdoor use with a camera tripod. It is recommended to use a quick-release plate with adjustable ball head for maximum flexibility in positioning the screen. This is a well-designed product based on the highly regarded and patented Screen2Go(TM) product. It weights less than 5 lbs in the pouch.